"There is time, there to sharpen my ears to try to hear the double bass, to hear it a little muddily, perhaps, over Villa Malcolm's hissy, crackly old sound system, in the echoey, public-swimming-pool acoustics of this gloomy place, which is so ugly, so grungy and yet so absolutely steeped, percolated in tango history, like an old familiar cracked mug stained with the tannins of a thousand comforting morning cuppas." Villa Malcolm, which started out its life in1928 as a space to play football, was in 1942 constituted as a sporting and recreational club. I'm not sure when tango took a foothold in the Club but I believe tango has been there for at least the past decade. Here's a video about Villa Malcolm. Although it's in Spanish with no sub-titles, the video will give you a feel for this special place which, to quote Terpsi, is truly "percolated in tango history". 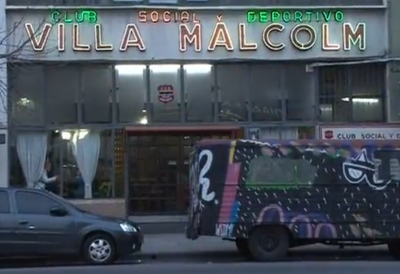 If you haven't yet been and you love tango, make sure you visit Villa Malcolm (Av. Cordoba 5064) on your next trip to Buenos Aires!